Saxson Global Services offer Business Process Outsourcing (BPO) options, in areas of Taxation and Accounting solutions. Our associates have dedicated offshore processing centres in India, where a team of Chartered Accountants ( Qualified and Semi Qualified) work on projects for our clients. We would be happy to work with your team in understanding your needs, expectations and offer cost effective processing solutions. In case you are interested in pursuing this approach, we could work towards the objective of improving operational efficiencies and cost competitiveness. Eventually your own staff, freed of accounting work, could focus more on servicing clients through increased customer contact and business development. As a first step we would normally run a Pilot project to ascertain the best combination of processes and outcomes. The offshore team in India has developed skills in processing Accounts including Payrolls, using internet based technology to access and process work. We have developed expertise in the area of Super Funds and Account Payables related work. Our clients load relevant accounts documents (such as bills and Invoices, bank statements etc of clients) on a server, with interview notes and special instruction sheets. The entries are then coded and accounts reconciled by our processing team using relevant country specific accounting software packages. The final deliverable to our clients is reconciled accounts, signed off with specific inquiries regarding any variations or exceptions. All this within timelines and costs more competitive than what can be processed inhouse or contracted onshore. We have high level of expertise in processing all administrative and accounting compliance related activities for Super Funds including Self Managed Super Funds (SMSF) or DIY Funds. We have developed skills and expertise in processing complex payroll arrangements. 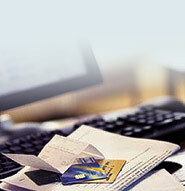 Cheque processing and other data entry related work for loans and mortgage application processing.